A new and exciting fact-filled card game that allows your to learn and have fun - without having to answer questions in order to win! More than 300 interesting historical facts fuel the journey as players travel forward and backward in time throughout game play. Cards are played based on decades and years and playhers can strategically determine how they want the direction of the game to move. Bonus points are gained by playing hte card of your birth year, the card for the new millenium, and by having the most of certain cards. 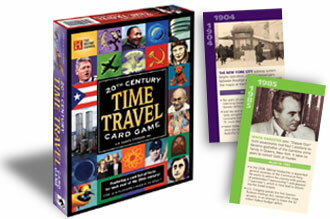 The 20th Century Time Travel Card Game is full of fast-paced fun for the entire family!